Naturally, we have to begin with the classic. Constructed from fir cuttings and boxwood, this traditional wreath is accented with flashes of vibrant red winterberry. This classic wreath is a great gift for new employees, interns or staff members who celebrate Christmas the old fashioned way. 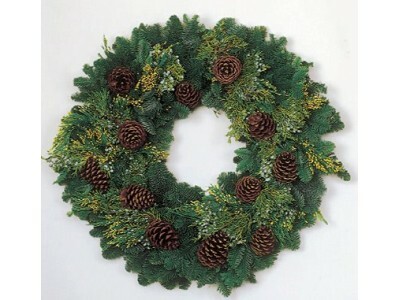 Our balsam fir wreath is one of our more economical offerings, making it ideal for large companies. Measuring roughly two feet in diameter, it creates a striking impression with its weather resistant bow and abundance of bright red berries. Beyond its appearance, the balsam fir wreath’s fragrance makes it a fantastic wreath for adorning mantles, doorways or other indoor areas. One of our most popular – and colorful – wreaths, the boxwood pomegranate Christmas wreath is a show stopping combination of fragrant boxwood, colorful pomegranates and eucalyptus. Uniting all of the traditional Christmas colors in a single, stunning display, this wreath is the perfect gift for that superstar employee or invaluable assistant. At Christmas Farms, we’re constantly evolving our line of wreaths. Every year, we source new materials – both locally and internationally – in an effort to create the most vibrant, wondrous ornamentations of the season. With our unique line of Christmas wreaths and dedication to offering only the highest quality products, we’re certain that your employees will be overjoyed to receive the gift of Christmas spirit this year.